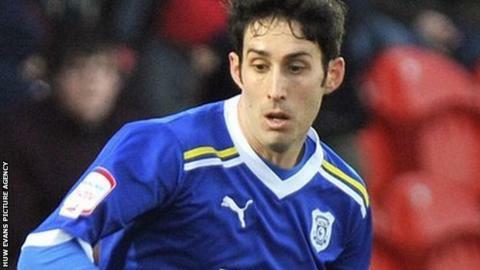 Peter Whittingham hopes Cardiff City's battle to stay in the play-offs will give them the momentum to finally claim a place in the Premier League. The Bluebirds have come close in the last three seasons, including a play-off final loss to Blackpool in 2009-10. Cardiff are currently sixth and face Derby County at home on Tuesday night. "It would be nice to just sneak in there and win the whole thing, to be honest, instead of being in there the whole time," said the midfielder. "But we need to get in there first and we've got Derby on Tuesday night. "It's a massive game for us and, if we get three points, we'll be flying." The Bluebirds stretched their unbeaten run to seven games to maintain their play-off push with a 1-0 win at Barnsley last weekend. Their fate remains in their own hands and Cardiff have home games against Derby on Tuesday and Leeds United on Saturday, before ending the regular season at Crystal Palace on 28 April. But Middlesbrough are snapping at their heels, just two points behind Cardiff going into Tuesday night's fixtures. "That's all we wanted - if it is in our own hands it's up to us," Whittingham said. "We've got three games left now, they're tough games but we've only got ourselves to blame if we don't get there. "It [looking at the league table] is all irrelevant as long as we win our games and we know we're in the play-offs. "If it's that then it's a great achievement; everyone probably would have taken that at the start of the season when you saw the gaffer coming in and how many players were left." Malky Mackay took over as manager this season following the sacking of Dave Jones and had to undertake a major squad rebuilding job, with a dozen players leaving the south Wales club. Despite the upheaval at the Cardiff City Stadium, the Bluebirds enjoyed a great - and unexpected - start to the season. "Everyone knows how well we did leading up to Christmas and it was always going to be tough for us after," Whittingham added. "Obviously teams know about us, they've played us once and they start to know our game and know our strengths. "It's proved a little bit harder but we've stuck in there and we're still going."